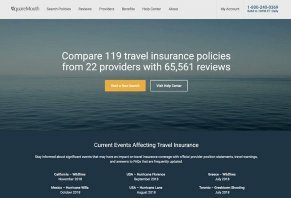 SquareMouth Reviews: Best Way to Buy Travel Insurance? In business since 2003 and based out of St. Petersburg, Florida, SquareMouth promises to provide customers with free, fast online quotes from nearly two dozen travel insurance carriers. SquareMouth Review: Is It the Best Way to Compare and Buy Travel Insurance Policies? SquareMouth is an online travel insurance comparison engine that allows you to perform custom searches, analyze coverage side-by-side, and purchase policies from every major financially stable provider in the US. This currently entails 20 different companies offering more than 115 policies. Visitors to the website can also learn what other policyholders are saying among their 62,000+ customer reviews. And if you encounter claims difficulty with one of their providers, SquareMouth will help mediate the situation and then remove the company from their website if it can’t be resolved. Zero Complaint Guarantee aside, how can you decide whether or not SquareMouth is the best travel insurance website for you? Let’s dive right in and take a look at some of the main coverages offered by their providers. What Types of Coverage Are Available from SquareMouth? Trip Cancellation – Covers travelers if they have to cancel due to unforeseen circumstances. Available coverages include employment layoff, hurricane and weather, work or medical-related reasons, and terrorism, to name just a few. Medical – Reimburses you for costs incurred as a result of a medical emergency. Insurers may look at travelers’ medical histories 60-180 days before policy purchase date to check for a “new diagnosis, a decline in health, or a change in prescription,” which they may consider a pre-existing condition. Evacuation – Includes medical and non-medical transportation and repatriation. Loss or Delay – Covers travelers in the event of travel or baggage delay, lost baggage and other personal items, and missed connections. Accidental Death – Typical options under this coverage include 24-Hour, Flight Only, and Common Carrier. Sports – Insures travelers participating in hazardous sports (e.g., skydiving, bungee jumping, high-elevation climbing, etc. ), traditional amateur sports, as well as related equipment and fees. Other Benefits – Other optional benefits include rental car damage, identity theft, and concierge service. According to the SquareMouth FAQ, most policies cover travelers of any age for multiple global destinations during the trip, while some allow travelers to insure only a single portion. From a coverage perspective, Trip Cancellation is time-sensitive, which means you’ll have to purchase it within 14-30 days (depending on the carrier) of your booking date. Outside of this, the FAQ explains that customers can purchase Standard Trip Cancellation policies up until the day before departure, while some International Medical Policies are available for purchase even after a trip has started. What Isn’t Covered Under a Travel Insurance Policy? Like any type of insurance, the policy you purchase through SquareMouth (which is sold by third-party carriers) will come with some exclusions where coverage doesn’t apply, or with restrictions that will stipulate sub-limits in regards to what can be paid out. For example, common exclusions include frequent flyer miles and reward points, while the per-item coverage limit for lost or damaged luggage is typically $250 - $500. Furthermore, the Cancel for Any Reason upgrade generally only provides a partial refund of up to 75% of your expenses. Pre-existing conditions are also commonly excluded under medical coverage, including pregnancy and mental illness. You can explore full coverage details on SquareMouth’s Travel Insurance Benefits page. We found that SquareMouth’s website worked a lot like other search engines. On the Travel Insurance Quotes page of the SquareMouth website, visitors can begin their search by selecting between a Single Trip, Annual, or Group policy. If you saved a previous search, you could enter the number here as well. Next, you’ll enter details like the number of travelers, departure and return dates, if you would like trip cancellation coverage, the cost of your trip, residency and citizenship details, when you made your first booking, the countries you’re traveling to, and if you have any remaining payments to make. After clicking on the Search Now button, users are taken to a results page that displays available policies in order of least to most expensive. You can also select the Compare box to compare different quotes and email them by clicking the “Email Quote” button. You’ll have the opportunity to view each policy’s certificate, which lists essential details like benefits, coverage amounts, and exclusions. After choosing and buying the best policy that meets your needs, your coverage will go into effect at midnight the following day. How Much Does SquareMouth Cost? The pricing for most personal lines insurance (home, auto, life, health, umbrella, etc.) policies is risk-dependent; that is, based on the specific circumstances surrounding each risk. Pro tip: Perhaps the biggest thing to remember about travel insurance, whether purchased via SquareMouth or another search engine (more soon) is that these are designed as reimbursement policies. In other words, you’re responsible for paying upfront, and then the provider reimburses you after your claim is approved. You can reach SquareMouth’s customer support department at 800-240-0369 or questions@squaremouth.com. What Are SquareMouth Customers Saying in Their Reviews? Among more than 10,500 customer reviews on ResellerRatings.com, SquareMouth held a 9.7-star average rating at the time of our research. Most compliments appeared to reference ease of use, trustworthy customer support, and competitive pricing. We also found quite a bit of customer feedback for SquareMouth on TripAdvisor, some of it going all the way back to 2014. Again, several emphasized that they had a great experience, while most complaints were claims-related (denials, long payouts, etc.). While more than one pointed out that SquareMouth wasn’t of any help when dealing with their claims issues, it’s important to emphasize that most of these complaints were related to policies sold by third-party providers, and not to SquareMouth themselves. How Can You Choose Between SquareMouth and Other Travel Insurance Providers? Just like when choosing auto, homeowners, or any other type of personal lines insurance, the right travel insurance plan for you will depend on a unique balance of budget and coverage. But, within the ever-growing insurance technology (cumulatively known as insurtech) industry, sites like SquareMouth can help consumers quickly compare quotes among some of the top providers available, based on their specific needs. This way, they don’t have to call around to each one or have an agent do it for them. InsureMyTrip also offers comparison quotes from dozens of travel insurance companies, features tens of thousands of combined policyholder reviews, lists extensive Q&A and FAQ sections, and comes with mostly positive online customer feedback. In fact, the biggest difference between these two options seems to be the number of providers they represent; SquareMouth provides access to 20, while InsureMyTrip offers 30. They also share many of the same provider options, including April, Arch RoamLight, Assistance USA, Berkshire Hathaway, IMG, Nationwide, TinLeg, Tokio Marine HCC, and TripAssure, to name just a few. As we outline in Your Comprehensive Guide to Buying Travel Insurance, before spending time on either of these sites, start by assessing whether or not you need travel insurance. In other words, what’s your risk tolerance? If you don’t mind the potential inconvenience and additional money outlay that could occur if things go south with your trip, the added cost might not deliver much value. From there, figure out which coverage you need by assessing your itinerary (single stay vs. multi-leg trip, one week vs. six months, etc. ), your level of health (you'll pay more, but it's important always to divulge pre-existing conditions upfront), participation in high-risk exposures like extreme sports, and valuable belongings or equipment. Pro tip: Don’t forget to call your credit cards, healthcare provider, and homeowner’s, auto, and life insurance carriers to find out what coverage you might already have in place. This could help avoid duplication, while also keeping your costs as low as possible. Finally, once you have a couple of options in place, take a deep dive into each travel insurance policy’s fine print to verify how much coverage is offered (paying close attention for medical and baggage, including delayed baggage), any exclusions/limitations or pre-existing conditions, what your responsibilities are in the event of a claim, and that each leg of your trip is covered. Based on the details listed on their websites, since both SquareMouth and InsureMyTrip offer access to many of the same companies, it stands to reason that all criteria being equal, consumers should receive the same rates between the providers they share. In addition, both sites seem to come with mostly positive online user feedback, have been in business for 15+ years, and allow customers to quickly enter their travel details and browse and compare travel insurance quotes. And, since most of the industry professionals we interviewed in our Travel Insurance Buyer’s Guide emphasized that you should shop around before choosing a provider, it only makes sense that consumers would use SquareMouth and InsureMyTrip as resources to help them accomplish this. Just remember that in most instances, the longer you wait, the more money you’ll pay for travel insurance coverage. In some cases, waiting too long could preclude you from eligibility altogether, so time is of the essence. Write a Review for SquareMouth!